The other night when I opened the fridge, I saw a half pack of pears which I bought a few days ago. At that time, I did not feel like eating those pears and I was worried that they might go off if I did not eat them sooner. I also knew that I was not in my “pear” mood that week as I had the more interesting bananas and strawberries to take care of. So I decided to do an experiment with the pears. The afternoon before I discovered the pears in the fridge, I had a conversation with my colleague Miss J about long-simmered soup. This conversation is crucial to my experiment with the pears. The conversation began with Miss J’s sickness at the time. Since I started working with Miss J, I had never seen her brought any home-cooked food, so I came to a conclusion that she does not cook. That day, she brought in some home-made soup as her lunch. I was very surprised and impressed by Miss J’s home-made soup. That was how our conversation about long-simmered soup began. There are so many different types of soups. Western soups are generally thicker and creamier while most Asian soups are usually based solely on broths which consist of a large amount of water rather than milk, cream or butter. Among Asian soups, there are still numerous types of soups, such as the Japanese’s miso soup, the Thai’s Tom Yum soup, the Korean’s Samgyetang (soup made with chicken and Korean ginseng), and of course a wide range of Chinese soups. Long-simmered soup is particularly well-known in Cantonese cuisine. The soup base is often simmered over low heat for several hours with a range of ingredients, often includes meats and bones, and the so-called “superfoods” such as goji berries, red dates and gingko nuts, etc. 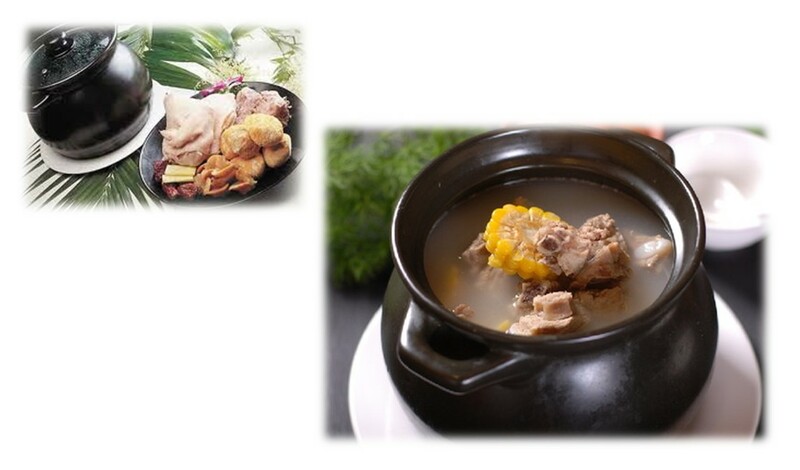 The Cantonese believe that this kind of soup can improve and strengthen one’s health, and when cooked with Chinese herbs it could even help cure our illness. To make a long-simmered soup, one put the raw materials into boiling water for a short period of time, and then simmered over low heat for a couple of hours. I was raised by a typical Cantonese family. When I was still living with my parents, my mother would make long-simmered soup as least once a week. She often forced me to drink (or eat if you prefer) as much as I could because this kind of soup is good for health and it will help me become physically fit. Most mothers enjoy telling their kids “what is good for health and what is bad health” the same way as telling them “what is right and what is wrong”. Before I start to go too detailed about long-simmered soup, I think I’d better to go back to my pear experiment. Inspired by the conversation I had with Miss J that afternoon about long-simmered soup, when I discovered the remaining pears in the fridge which I was not in the mood of eating, a spark of idea came across my mind, I decided to boil the pears with water, similar to the process of making long-simmered soup. So I cooked the pears in boiling for a short period of time, and then had it simmered for about 30 mins, yeah, not long-simmered, but rather “short”-simmered. Well, the end product – pear soup – tasted okay, it was an interesting taste, like a sweet soup rather, I only had a little bit that night, and then I put the rest into the fridge. The next night, or maybe two nights later, I opened the fridge to look for something to drink, and I saw my “pear soup”, so I poured some into a glass to drink it. It tasted delicious! This texture is not as thick as having the pears mashed in a blender. It tasted like pear juice! It was not too sweet as supermarket juices. I would say my “pear soup” aka “pear juice” is much healthy than supermarket juices as the nutrients of the pears were leaked into the “soup” aka “juice”. This Asian soup making method is a great way to get rid of the unwanted but non-rotten fruits in the fridge. My tip is: have it cold!